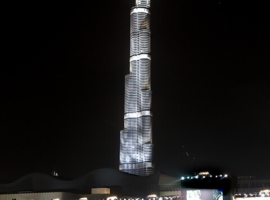 For the Red Bull X-Fighters event in Downtown DubaiA&O Technology immersed the Burj Khalifa with a huge number of FALCON searchlights in white light. 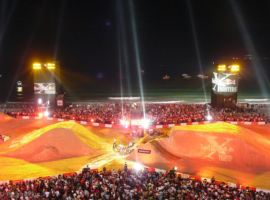 The Red Bull X-Fighters World Tour reached Dubai and demonstrated the Emirate’s passion for X-treme biking: the sold out event (15.000 sold tickets) was a smashing success. 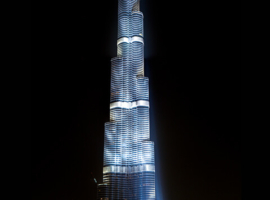 It was the first time, the show was held in the Dubai, UAE. 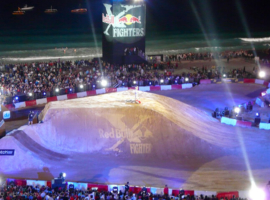 The special of this years kick off for the 2011 season is the location at Jumeirah Beach Resort (JBR The Walk) – directly on the beach, like never before in the history of the Red Bull X-Fighters. 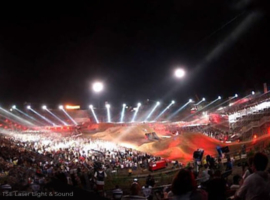 On the FMX event where the best of the best of acrobatic extreme bikers (the six top riders of 2010 season) do daredevil jumps on their roaring motorbikes and bathing at the same time in the mass’ exultation, the bright and powerful FALCON xenon searchlights matching perfectly. Strong beams delegates the loops and flips, the tricks and stops and finally Dany Torres of Spain reaches the triumph. 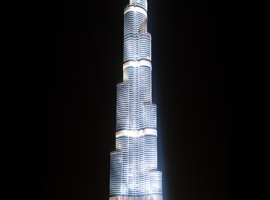 A&O Technology delivered by order of Eclipse Staging Services Dubai a total of 16 x FALCON BEAM 7kW. 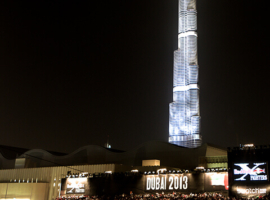 Eclipse was contracted by Blink Events for show lighting and power distribution. 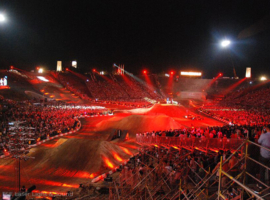 Project Manager Arran Hopkins (Eclipse) was relying on the impact effect of the FALCON Searchlights and made use of inter alia 16 FALCON BEAM colour 7.000W for staging the FMX-Parcours.The fixtures were positioned along the Dubai track. 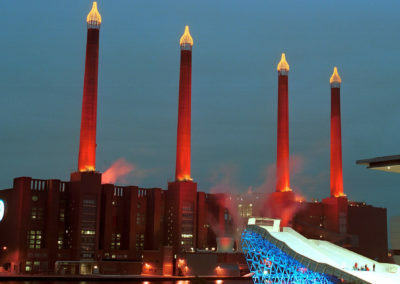 They were applied during the whole race for setting in stage the “flying riders”. 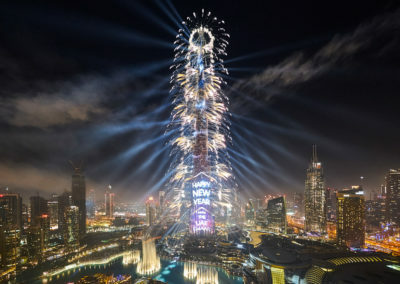 The Red Bull X-Fighters World Series kick off event in Dubai was under the patronage of HH Sheikh Hamdan Bin Mohammed Bin Rashid Al Maktoum is called the most prestigious tour in the world of Freestyle Motocross. 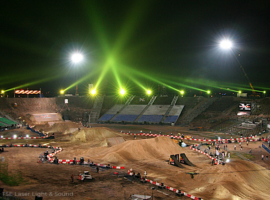 For the final stop in Warsaw on the Red Bull X-Fighters Tour 2008, TSE Laser Light & Sound was commissioned to illuminate the 500-metre FMX circuit. 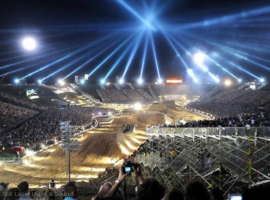 Fifteen thousand tons of earth were specially transported to the X-Lecia stadium to create the circuit, whilst 35 FALCON® BEAM 7000W xenon searchlights manufactured by alpha one were deployed as part of the lightshow for the world’s best motocross freestylers. 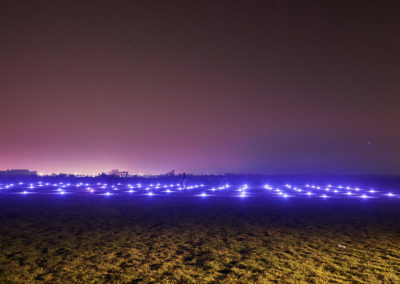 The lighting design by Michiel Milbou ( www.milbou.be) for the open air show required the positioning of thirty-one of the powerful xenon searchlights all round the upper tier of the X-Lecia stadium on two-metre-high rostrums. 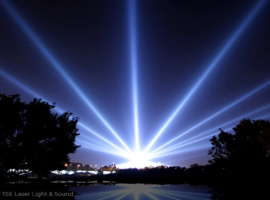 The other four FALCON® xenon searchlights were used to accentuate the start and finish of the course. 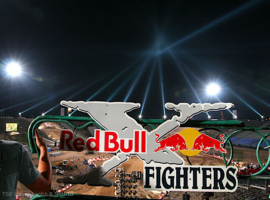 The X-Games are considered the most prestigious event in the FMX calendar. 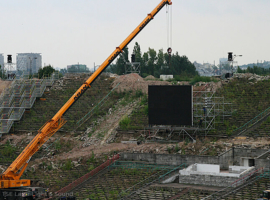 This was the first time they had been held in Poland. 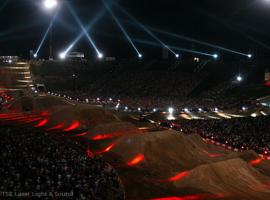 Thirty-five thousand spectators this year followed the sixth Moto X Freestyle Challenge, which was also the last event ever to be held at the X-Lecia stadium because the ‘Stadium of the Decade’, as it was once known, is being demolished to make way for a new multifunction national stadium for the European Football Championships 2012. 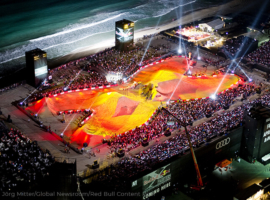 Bathed in the vibrant light of the FALCON® BEAM 7,000W searchlights, the 2008 finals made for a spectacular evening, featuring twelve FMX aces divided into four teams of three for the X-Fighters Top 4 with a further eight competing in the disciplines Step Up, Speed & Style, Quarterpipe Jam and Classic FMX, thrilling fans packing the stadium with spectacular jumps. Lukasz Kubiak and Piotr Basek of TSE ( www.tse.pl), A&O Technology’s clients, were clearly much impressed both with the equipment and the use made of it by the lighting designer.